This piece, entitled 'Macrodontia Box II' is part of a series of pieces that I have been making inspired by the Coleoptera order. The order of beetles is thought to contain almost 25% of all species and so the variety of shapes, colours and textures that it contains is absolutely extraordinary. 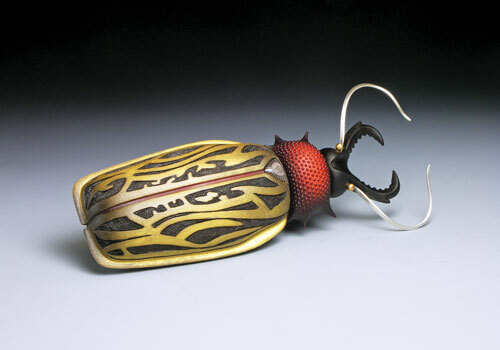 I have always used other materials in my pieces but these beetle boxes have really pushed my imagination to find ways to recreate some of the fine details and surface finishes that the real beetles exhibit. The process begins with visual research. I gather loads of images from books and the internet, picking out beetles that are particularly amazing â€“ whether it be an eye-catching overall shape, an incredible colour or texture, or beautiful detail. I then start making sketches, often for a number of pieces. These are then refined and individual scale drawings are made for each piece, often containing notes with ideas about colours or how certain parts will be created. This piece was made in a number of parts - nine in total. First, the collar was made to finish around the edge of the stainless steel capsule that would line the inside of the box. This was made by piercing out a ring of copper that was then turned to fit around the capsule. An image of a diatom was then printed onto paper and cut out to fit the ring and glued onto the surface. An epoxy coating was then added to seal and protect the image and add extra depth and sheen. I then made the small triangle that fits at the top of the wing case in the same way. The main body was made from a piece of English sycamore (Acer pseudoplatanus). First, a hole was turned to fit the larger half of the stainless steel capsule and the copper ring, then the main form was created with some offcentre turning and completed with a reciprocating carver, needle files and abrasives. The design was then drawn onto the front surface and scorched into the wood with a pyrography machine and the remaining surface was gold leafed. It was then airbrushed with acrylic inks to tone down the bright gold leaf around the edges, the red line was painted down the centre and finally the capsule and copper parts were glued to it. The main section of the lid was also made from English sycamore, turned each end to fit the lid of the stainless steel capsule and the dowel of the head section. The rest was carefully carved into shape. It was then airbrushed with inks and a fine texture was created with the application of tiny coloured acrylic resin dots. The antennae were made out of sterling silver wire, hammered into a square profile, tapered down and then curved. I then made a couple of gold balls by melting some reclaimed 22 carat gold and soldered these to the bases of each antennae. The basic shape of the head section was turned out of African blackwood (Dalbergia melanoxylon) and carved to finish. This was drilled to fit the antennae and all the pieces were assembled together to complete the box.